As a vacation rental host, you’re always striving to increase your occupancy rate. After all, a higher occupancy rate means more money in your pocket – there’s no denying that. Finding that “sweet spot” when it comes to your nightly vacation rental rate can be tough, especially if you’re attempting to do it on your own without the assistance of paid help. Below, we’ve outlined some important questions to ask yourself as you consider your business and whether it’s time to make some changes. How often are you fully booked? We’re all aware that a high occupancy is great and something every host strives for, but it’s also important to consider at what cost you’re achieving total occupancy. 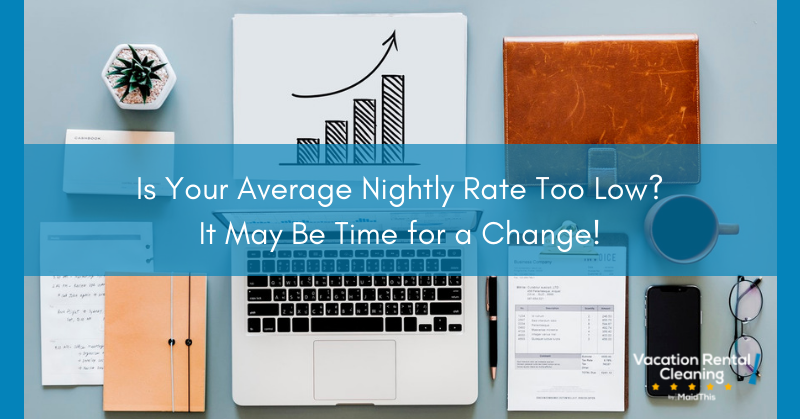 How long has it been since you changed your nightly rate, and more importantly, have you ever changed it? When you last changed it, did you raise or lower it? How often are you fully booked exactly the way you want to be? How often do “prime” nights or weekends go unbooked? Answering these questions is going to require a deep-dive into your records – and, if you’re really interested in getting the whole picture, you should be digging pretty deep. Look at numbers from the last quarter, the last year, and, depending on how long you’ve been in business, the last 2-5 years. Once you’ve got some solid numbers written down, start looking more closely at your seasonal changes. How often do you make changes based on “high season” and “low season”? We’ve discussed the importance of adjusting your rates according to the season, but as you make these adjustments, it’s important to track how you’re performing and what works and what doesn’t. How much of a discount did you offer potential guests during low season in years past? How did that affect your occupancy levels? How many times did you make changes to your nightly rate in past low seasons? How many rate hikes were there, if any? How many rate reductions? When did these occur? When the high season comes back around, where did you set your nightly rate? Observing these trends should show you a few patterns if you’re looking for them carefully. As you sift through your records, look out for rates that remained the same from week to week, month to month, and year to year. If you’ve got great guest feedback and ratings, are regularly booked (if not to capacity, at least consistently booked), and you’re not slightly raising your rates every year or season to season, you’re likely missing out on money that your guests would willingly pay. You can still give your guests an awesome nightly rate without selling yourself short. Look at your numbers – and we mean really look at them – to find patterns, get a better idea of your habits, and where you can potentially make changes. Here’s to a great Q4!